Me and my sonny boy love rice, but do not favour Biryani, where my daughter and husband love flavoured rice and Biryani too! Every now and then request comes from them and steaming hot Biryanis comes out straight from my kitchen, but for me and sonny boy needs something else along with Biryani to fill our tummy. It's not that because Biryanis are rich and laden with calories, but we find Biryani a bit hard to swallow. I find Biryani rice too dry for my liking, almost my chest starts to hurt, however I haven't stopped making Biryani for daughter and husband as they both love it ! I have been making various kind of Biryanis with vegetables, potatoes and Paneer, sometimes with with koftas too. It kind of gets boring too as always 3-4 kind of same vegetable I have been using like cauliflower, carrots, capsicum and green beans. This Christmas holiday as usual daughter asked for Biryani and obviously husband second that idea, and we prepared Butternut Squash, Spinach and Coconut Biryani, okay it's not authentic and traditional way I prepared, also we added totally different kind of vegetables, as I love to celebrate those veg and fruits while they are in season. Also added coconut milk, so this Biryani is totally vegan and coconut milk gives the rice in this dish a yummy creamy flavour and texture, for me it was much better to swallow each and every grain! 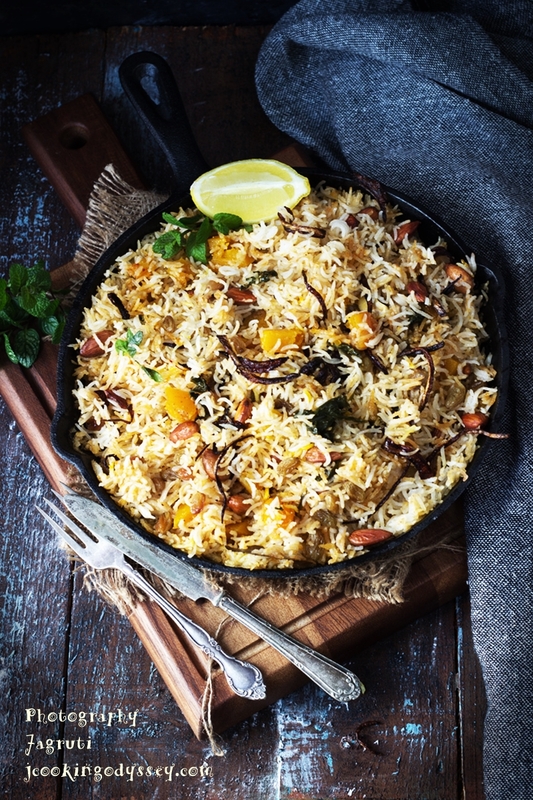 Although Butternut Squash, Spinch and Coconut Biryani was prepared with different method and different vegetables, still the flavours of the Biryani were magnificent. It was rich, aromatic and tasteful. Whole spices, vegetables, coconut milk blend really well and the entire mix was a great treat for all of us, actually daughter kept having consecutively over a few days! 500 g good quality Basmati rice washed, soaked and drained for 20 minutes. In a large saucepan heat oil, add all the whole spices, once they crackle add thinly spiced onion. Gently cook the onion and spices for 3-4 minutes, then add onion paste. Continuously keep cooking for 2-3 minutes and add garlic and ginger paste. sauté this mixture for another 1-2 minutes, add red chilli powder, garam masala, kitchen king masala and nutmeg, black pepper and cardamom powder. Add almond and poppy seeds paste and salt. Add butternut squash and spinach, mix well. Cook the mixture for 1-2 minute. Turn off the heat and add kewra water. Mix the saffron, coconut milk and 1/4 cup water. Bring it to the boil and leave it aside. Spoon half of the vegetable mixture into a oven proof dish, skillet or casserole. Top with the half of the rice and sprinkle almonds, raisins and fried onion. Repeat with another layer of the remaining vegetables, the rest of the rice and almonds and raisins. Now carefully pour coconut milk and saffron mixture over the rice and vegetables. Cover tightly with foil and bake for 40 minutes until the rice has absorbed all the liquid and is tender. 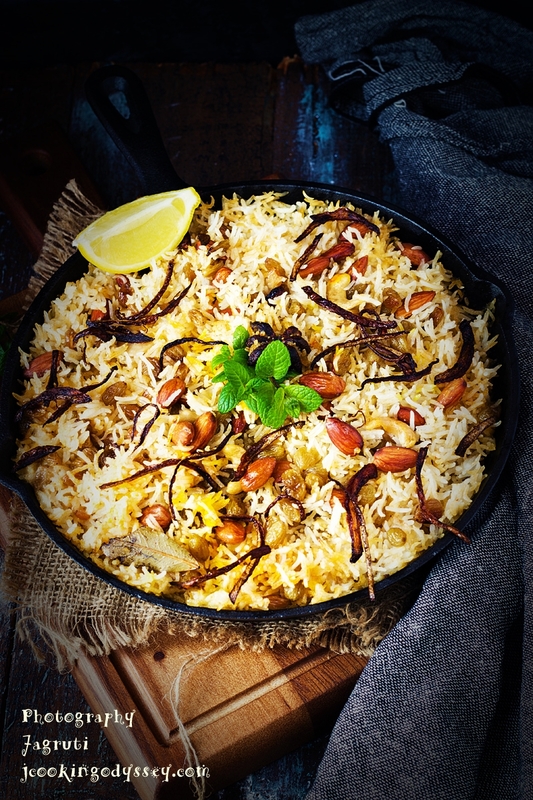 Garnish Biryani with fresh mint leaves and fried onion. Serve steamy and piping hot Biryani with fried papad, dollop of yogurt and Cranberry, orange and mango chutney with Indian Tadka.